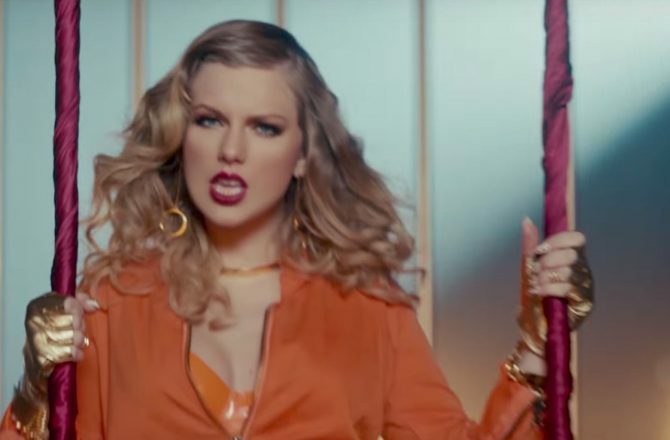 If you do not want to get an ear worm, do not listen to Taylor Swift’s ‘Look What You Made Me Do.’ Actually, that’s probably impossible. The video was released shortly after 8pm Sunday night at the VMAs. Twelve hours later, the track was the first thing I heard at my Soul Cycle class on Monday morning. By mid-day, the internet was going crazy over all the symbolism in the vid. If you need to kill a few hours, dive down the rabbit hole of stories online decoding the disses on Tay’s enemies and tags for her friends. All of this, however, is not our narrative. 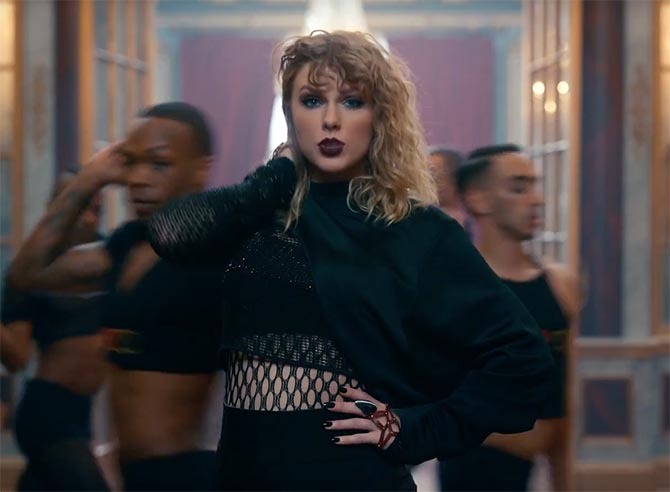 We are here, obviously, to identify the buckets of jewelry in “Look What You Made Me Do.” The pieces in the multi-scene video range in price from “if you have to ask…” to $65. In the snake scene, Taylor is decked out in snake jewels, lots of snake jewels. 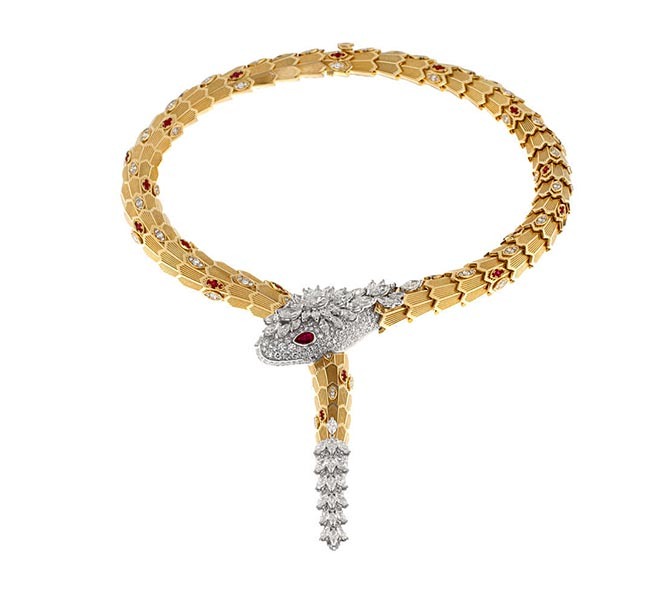 The biggest piece is a white and yellow gold Serpenti necklace by Bulgari. 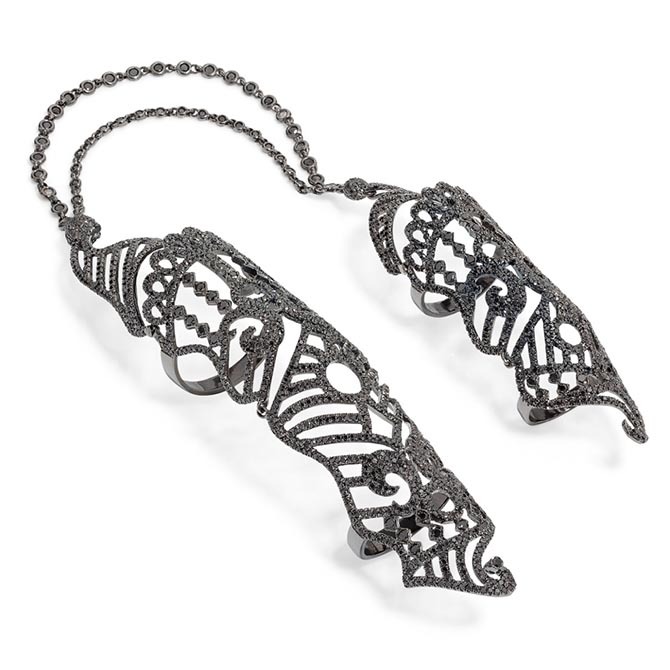 It is price upon request which is jewelry speak for very expensive. The Bulgari necklace worn by Swift is set with over 10-carats of marquise and brilliant-cut diamonds and 71-round and pear-shape rubies. Detail shots of the rings by Lydia Courteille, Le Vian and Borgioni, Taylor Swift wears. Detail of Swift showing the Bulgari Serpenti necklace and mother-of-pearl and gold Bulgari Serpenti bracelets as well as snake gold and diamond rings and bracelets by Borgioni and a ruby double finger ring by Lydia Courteille. In a scene with her Grammy, Swift wears a Lydia Courteille gold and diamond ear cuff and snake bracelet in her hair. 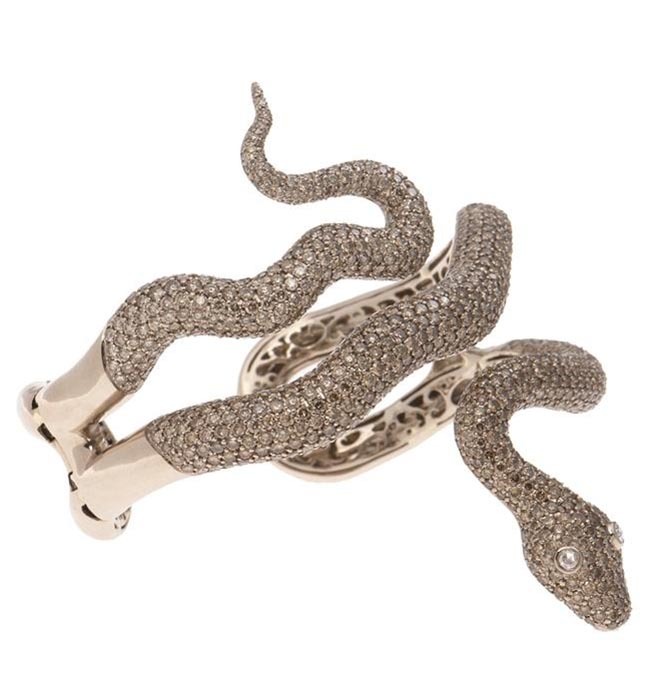 The Lydia Courteille snake diamond bracelet Swift wears in her hair. In the Bird Cage scene, Swift sings on a swing in the Edie Hoops by Jenny Bird ($65) and a gold vermeil Quill Cuff by Shaun Leane. In the biker scene, Swift sports The Choker in High Polish by Jenny Bird ($125). When Swift addresses her girl squad, she is wearing a choker that matches her patent leather ensemble and ebony and diamond hoops by Borgioni. 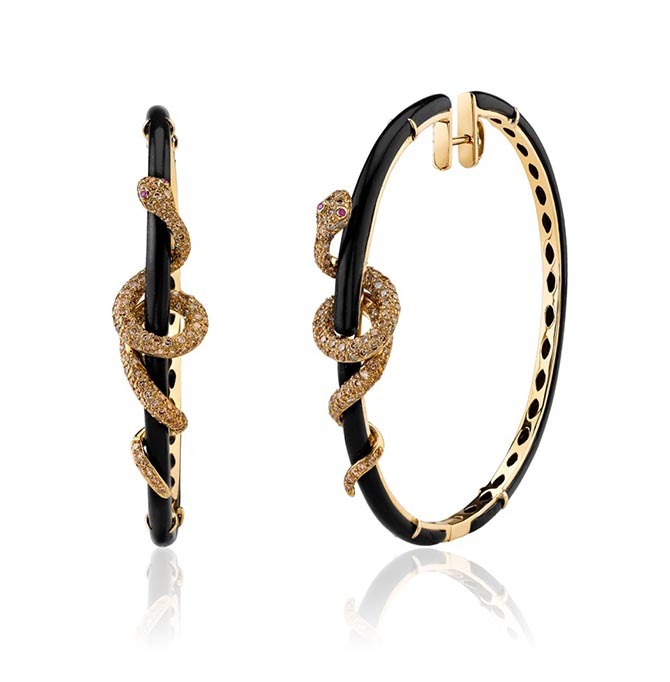 Ebony and diamond snake hoops from Borgioni worn by Swift. In the “I Heart TS” scene, Swift wears a diamond in carbon fiber ring by Mattia Cielo. Swift wears Shaun Leane black diamond Saber earrings and a Noudar black diamond double finger ring with her “Rep” ensemble. The black diamond double finger ring by Noudar worn by Swift. Taylor Swift wearing Morganite and diamond rings from Le Vian in the graveyard scene. 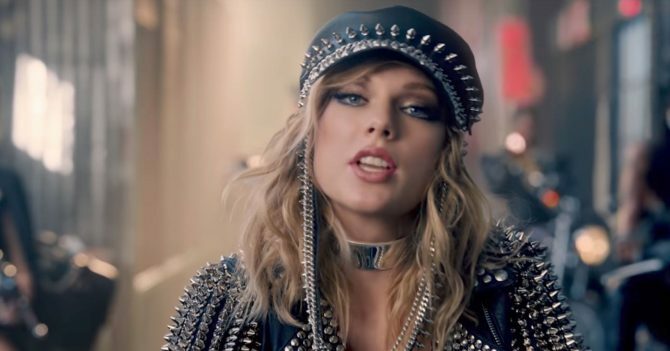 See all of the jewelry in Taylor Swift’s “Look What You Made Me Do” video from her new album Reputation.